Tonight, a couple of us went night snorkeling. The mangroves and the crest can barely be made out from the edge of the dock. Looking down with my flashlight, I can see the diadema crawling along the side of the dock at the surface of the water. I quickly put on my snorkel gear and jumped into the water as Nick followed right behind. We both moved slowly with our flashlights on because it was very dark. The silversides were darting back and forth through our lights as we moved through the dark. It was another world at night. The urchins and squirrelfish were more active. The diadema and lytechinus were crawling about munching on algae. There were a bunch of worms about one foot or more crawling about. As we sawm to deeper water, we began to come across more beautiful creatures. 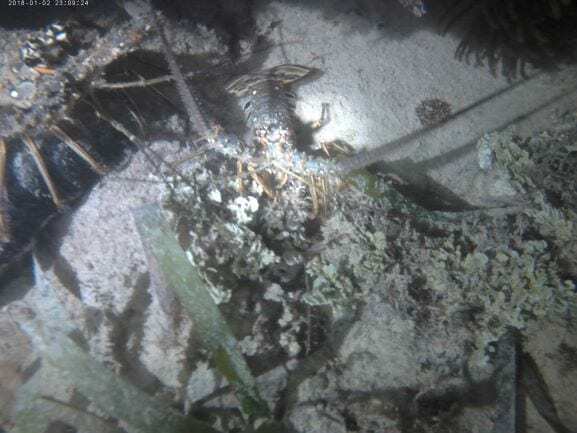 Hiding in crevices were a couple of spiny lobsters, one big and one small. A couple of meters away from the lobsters was a big yellow stingray sitting on top of some Thalassia. I shone the light on top of it and it didn’t move, giving me the perfect opportunity to take a photo. Yellow stingray laying on Thalassia. Before departing the ray, I gave it a little pet on the nose. The ray was not the only thing we saw. We saw many small common octopus. When we shine the lights on them, they change colors. They change to a blue, green, and brown mix. They put on a fantastic display changing colors as we got closer to look at them. 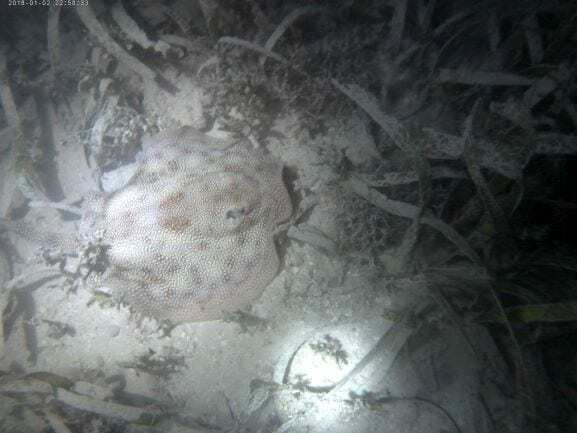 Going on the night dive has been the best experience I had here. I plan to do one more night snorkel before we have to leave. You didn’t eat the lobsters?